Every open hole distorts (strains) under loading. Cyclic loading results in repeated loading and unloading of the hole. 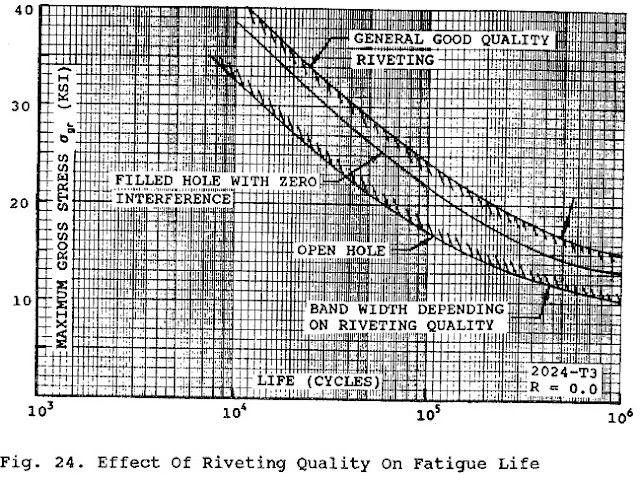 This is the mechanism for fatigue crack initiation and growth. A tightly installed plug (fastener) in a hole inhibits this strain-deformation. Burrs increase stress concentration at hole edges. 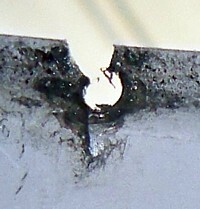 Crack-growth is largely independent of material tensile strength. Chart from Repairs to Damage Tolerant Aircraft by T. Swift, Federal Aviation Administration, FAA-AIR-90-01. 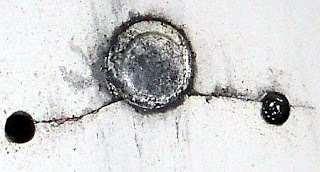 Proper riveting (filling the hole) increases fatigue life over an unfilled hole. An open hole increases stress by a factor of three times. A filled hole reduces this stress concentration to two times. 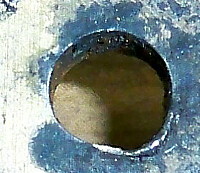 An interference fit filled hole, for example bucking a rivet into the hole further reduces the stress concentration factor. Per FAA-AIR-90-01 Fig. 20. Stop-drilled holes should be filled. Also, use proper rivet technique so that the rivet swells and fills the hole. This places the hole boundary in compression. For the rivet to swell and fill the hole the rivet must be driven squarely and not "clinched" When clinching occurs the hole is not properly filled and swelling does not occur. Thus the beneficial residual compressive stresses are not present. When this occurs the fatigue life is no more than an open hole. The presence of a hole has little effect on the static fracture strength of a ductile material. The presence of a hole has a large effect on the static fracture strength of a brittle material. Fracture strength is a function of hole size "hole size effect" and for multiple holes, hole interaction - in short the subject is complex. Microscopic fatigue on a rivet can cause serious damage to the aircraft hardware and it's so noteworthy how the new Boeing 767 has avoided the use of that as I saw in National Geographic.